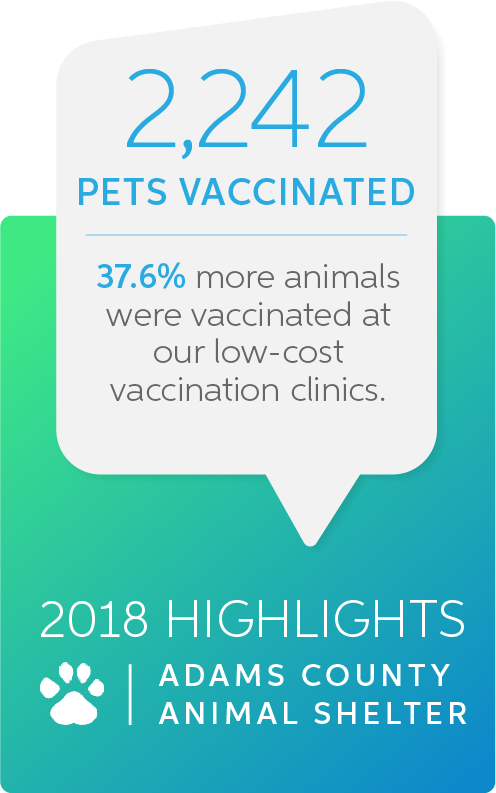 33% more pets were microchipped during our monthly microchip clinics, improving the likelihood their owners may be contacted when their pet is lost. We placed 33% more animals with our volunteer foster parents, including 77 bottle-baby kittens. Our volunteer service hours increased for a fourth year in a row, highlighting the dedication of our amazing volunteer corp. who help us provide the best service to our growing list of animals in our care, and our community. We maintained our save rate during 2018, with a slight increase from 89.1 to 89.2. 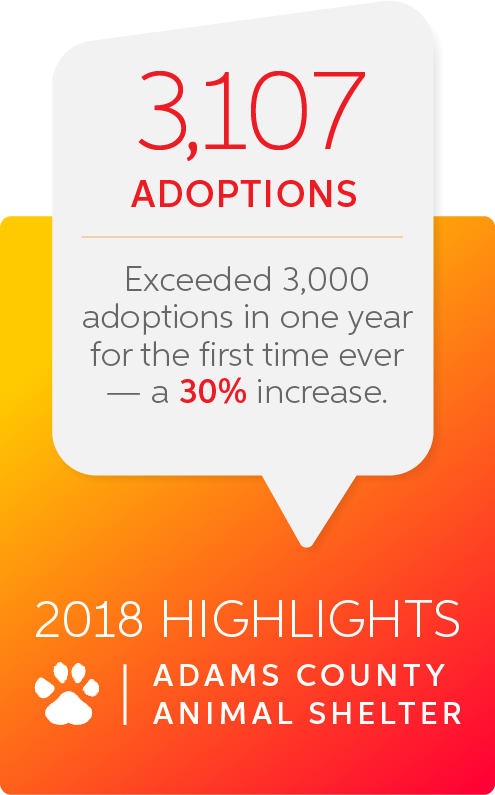 The launch of our new and improved animal shelter website resulted in a 300% increase in average monthly unique page views. 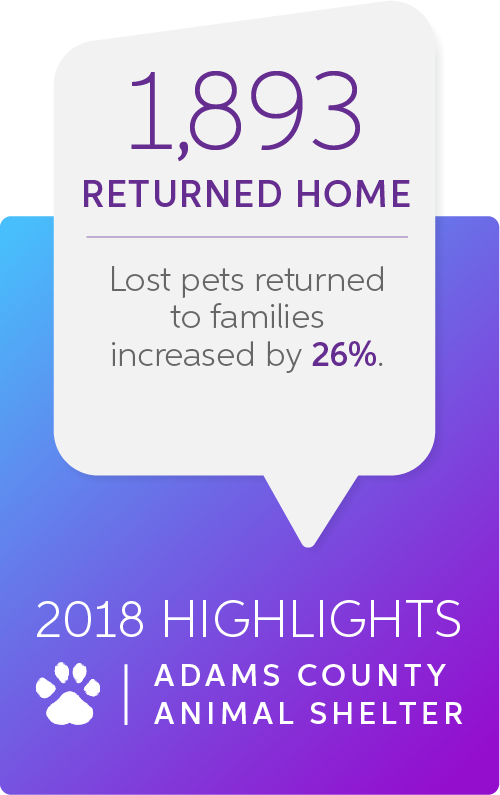 Our animals’ average length of stay decreased from 10 days to 9, meaning we’re improving efficiencies in animal care and adoption, and reuniting animals with their owners. We launched the pilot program for Hikes for Hopefuls in 2018, with 150 active dogs adopted! Our Hikes for Hopefuls program provides much needed exercise and stimulation for our active dogs, helping settle their energy in their kennels, and improve their potential for adoption. For the second year in a row, we participated in the NBC Universal/Telemundo Clear the Shelters event where 80 animals found forever homes in 2.5 hours! In 2018, we broke ground on the brand new Riverdale Animal Shelter. We’re excited for continued progress of the construction! Adams County Animal Shelter/Adoption Center proudly reports data on a monthly basis to Animal Shelters Count, a national database of sheltered dog and cat statistics by county to help inform facts and data- driven solutions to save animal lives. Adams County Animal Shelter and Adoption Center submits annual statistics as required by the Pet Animal Care Facility Act, (PACFA) . View our recent PACFA statistics below. Adams County Animal Shelter/Adoption Center is an open-admission animal shelter, meaning we take in all animals regardless of age, breed, health, and/or temperament. 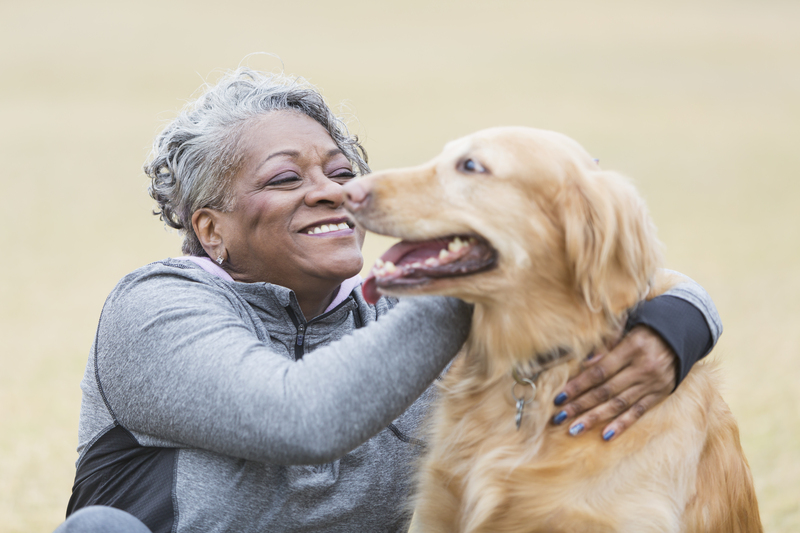 We do not euthanize for time or space, meaning there is also no set time limit for how long a pet can remain in our care while awaiting its forever home. Adams County Animal Shelter also partners with more than 40 rescues organizations, and numerous animal shelters along the Front Range to place animals with a variety of differing medical and behavior support needs. Together we are making a difference.